This article is about the 366-day year. For a 365-day year, see common year. For other uses, see Leap year (disambiguation). An image showing which century years are leap years in the Gregorian calendar. Over a period of four centuries, the accumulated error of adding a leap day every four years amounts to about three extra days. The Gregorian calendar therefore drops three leap days every 400 years, which is the length of its leap cycle. This is done by dropping February 29 in the three century years (multiples of 100) that cannot be exactly divided by 400. The years 1600, 2000 and 2400 are leap years, while 1700, 1800, 1900, 2100, 2200 and 2300 are not leap years. By this rule, the average number of days per year is 365 + ​1⁄4 − ​1⁄100 + ​1⁄400 = 365.2425. The rule can be applied to years before the Gregorian reform (the proleptic Gregorian calendar), if astronomical year numbering is used. This graph shows the variations in date and time of the June Solstice due to unequally spaced "leap day" rules. Contrast this with the Iranian Solar Hijri calendar, which generally has 8 leap year days every 33 years. The Gregorian calendar was designed to keep the vernal equinox on or close to March 21, so that the date of Easter (celebrated on the Sunday after the ecclesiastical full moon that falls on or after March 21) remains close to the vernal equinox. The "Accuracy" section of the "Gregorian calendar" article discusses how well the Gregorian calendar achieves this design goal, and how well it approximates the tropical year. The following pseudocode determines whether a year is a leap year or a common year in the Gregorian calendar (and in the proleptic Gregorian calendar before 1582). The year variable being tested is the integer representing the number of the year in the Gregorian calendar. The algorithm applies to proleptic Gregorian calendar years before 1, but only if the year is expressed with astronomical year numbering. It is not valid for the BC or BCE notation. The algorithm is not necessarily valid for years in the Julian calendar, such as years before 1752 in the British Empire. The year 1700 was a leap year in the Julian calendar, but not in the Gregorian calendar. February 29 is a date that usually occurs every four years, and is called leap day. This day is added to the calendar in leap years as a corrective measure, because the Earth does not orbit the sun in precisely 365 days. The Gregorian calendar is a modification of the Julian calendar first used by the Romans. The Roman calendar originated as a lunisolar calendar and named many of its days after the syzygies of the moon: the new moon (Kalendae or calends, hence "calendar") and the full moon (Idus or ides). The Nonae or nones was not the first quarter moon but was exactly one nundina or Roman market week of nine days before the ides, inclusively counting the ides as the first of those nine days. This is what we would call a period of eight days. In 1825, Ideler believed that the lunisolar calendar was abandoned about 450 BC by the decemvirs, who implemented the Roman Republican calendar, used until 46 BC. The days of these calendars were counted down (inclusively) to the next named day, so February 24 was ante diem sextum Kalendas Martias ("the sixth day before the calends of March") often abbreviated a. d. VI Kal. Mart. The Romans counted days inclusively in their calendars, so this was actually the fifth day before March 1 when counted in the modern exclusive manner (not including the starting day). The Republican calendar's intercalary month was inserted on the first or second day after the Terminalia (a. d. VII Kal. Mar., February 23). The remaining days of Februarius were dropped. This intercalary month, named Intercalaris or Mercedonius, contained 27 days. The religious festivals that were normally celebrated in the last five days of February were moved to the last five days of Intercalaris. Because only 22 or 23 days were effectively added, not a full lunation, the calends and ides of the Roman Republican calendar were no longer associated with the new moon and full moon. The Julian calendar, which was developed in 46 BC by Julius Caesar, and became effective in 45 BC, distributed an extra ten days among the months of the Roman Republican calendar. Caesar also replaced the intercalary month by a single intercalary day, located where the intercalary month used to be. To create the intercalary day, the existing ante diem sextum Kalendas Martias (February 24) was doubled, producing ante diem bis sextum Kalendas Martias. Hence, the year containing the doubled day was a bissextile (bis sextum, "twice sixth") year. For legal purposes, the two days of the bis sextum were considered to be a single day, with the second half being intercalated; but in common practice by 238, when Censorinus wrote, the intercalary day was followed by the last five days of February, a. d. VI, V, IV, III and pridie Kal. Mart. (the days numbered 24, 25, 26, 27, and 28 from the beginning of February in a common year), so that the intercalated day was the first half of the doubled day. Thus the intercalated day was effectively inserted between the 23rd and 24th days of February. All later writers, including Macrobius about 430, Bede in 725, and other medieval computists (calculators of Easter), continued to state that the bissextum (bissextile day) occurred before the last five days of February. In the older Roman Missal, feast days falling on or after February 24 are celebrated one day later in leap year. Until 1970, the Roman Catholic Church always celebrated the feast of Saint Matthias on a. d. VI Kal. Mart., so if the days were numbered from the beginning of the month, it was named February 24 in common years, but the presence of the bissextum in a bissextile year immediately before a. d. VI Kal. Mart. 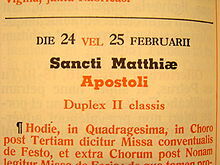 shifted the latter day to February 25 in leap years, with the Vigil of St. Matthias shifting from February 23 to the leap day of February 24. This shift did not take place in pre-Reformation Norway and Iceland; Pope Alexander III ruled that either practice was lawful (Liber Extra, 5. 40. 14. 1). Other feasts normally falling on February 25–28 in common years are also shifted to the following day in a leap year (although they would be on the same day according to the Roman notation). The practice is still observed by those who use the older calendars. The Revised Bengali Calendar of Bangladesh and the Indian National Calendar organise their leap years so that the every leap day is close to a February 29 in the Gregorian calendar and vice versa. This makes it easy to convert dates to or from Gregorian. The Thai solar calendar uses the Buddhist Era (BE), but has been synchronized with the Gregorian since AD 1941. From AD 8 the Julian calendar received an extra day added to February in years that are multiples of 4. The Coptic calendar and Ethiopian calendar also add an extra day to the end of the year once every four years before a Julian 29-day February. This rule gives an average year length of 365.25 days. However, it is 11 minutes longer than a tropical year. This means that the vernal equinox moves a day earlier in the calendar about every 131 years. The Revised Julian calendar adds an extra day to February in years that are multiples of four, except for years that are multiples of 100 that do not leave a remainder of 200 or 600 when divided by 900. This rule agrees with the rule for the Gregorian calendar until 2799. The first year that dates in the Revised Julian calendar will not agree with those in the Gregorian calendar will be 2800, because it will be a leap year in the Gregorian calendar but not in the Revised Julian calendar. This rule gives an average year length of 365.242222 days. This is a very good approximation to the mean tropical year, but because the vernal equinox year is slightly longer, the Revised Julian calendar for the time being does not do as good a job as the Gregorian calendar at keeping the vernal equinox on or close to March 21. The Chinese calendar is lunisolar, so a leap year has an extra month, often called an embolismic month after the Greek word for it. In the Chinese calendar the leap month is added according to a rule which ensures that month 11 is always the month that contains the northern winter solstice. 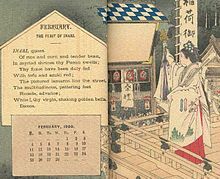 The intercalary month takes the same number as the preceding month; for example, if it follows the second month (二月) then it is simply called "leap second month" i.e. simplified Chinese: 闰二月; traditional Chinese: 閏二月; pinyin: rùn'èryuè. The Hebrew calendar is lunisolar with an embolismic month. This extra month is called Adar Alef (first Adar) and is added before Adar, which then becomes Adar Bet (second Adar). According to the Metonic cycle, this is done seven times every nineteen years (specifically, in years 3, 6, 8, 11, 14, 17, and 19). This is to ensure that Passover (Pesah) is always in the spring as required by the Torah (Pentateuch) in many verses relating to Passover. In addition, the Hebrew calendar has postponement rules that postpone the start of the year by one or two days. These postponement rules reduce the number of different combinations of year length and starting days of the week from 28 to 14, and regulate the location of certain religious holidays in relation to the Sabbath. In particular, the first day of the Hebrew year can never be Sunday, Wednesday or Friday. This rule is known in Hebrew as "lo adu rosh" (לא אד"ו ראש), i.e., "Rosh [ha-Shanah, first day of the year] is not Sunday, Wednesday or Friday" (as the Hebrew word adu is written by three Hebrew letters signifying Sunday, Wednesday and Friday). Accordingly, the first day of Passover is never Monday, Wednesday or Friday. This rule is known in Hebrew as "lo badu Pesah" (לא בד"ו פסח), which has a double meaning — "Passover is not a legend", but also "Passover is not Monday, Wednesday or Friday" (as the Hebrew word badu is written by three Hebrew letters signifying Monday, Wednesday and Friday). One reason for this rule is that Yom Kippur, the holiest day in the Hebrew calendar and the tenth day of the Hebrew year, now must never be adjacent to the weekly Sabbath (which is Saturday), i.e., it must never fall on Friday or Sunday, in order not to have two adjacent Sabbath days. However, Yom Kippur can still be on Saturday. These rules for the Feasts do not apply to the years from the Creation to the deliverance of the Hebrews from Egypt under Moses. It was at that time (cf. Exodus 13) that the God of Abraham, Isaac and Jacob gave the Hebrews their "Law" including the days to be kept holy and the feast days and Sabbaths. Years consisting of 12 months have between 353 and 355 days. 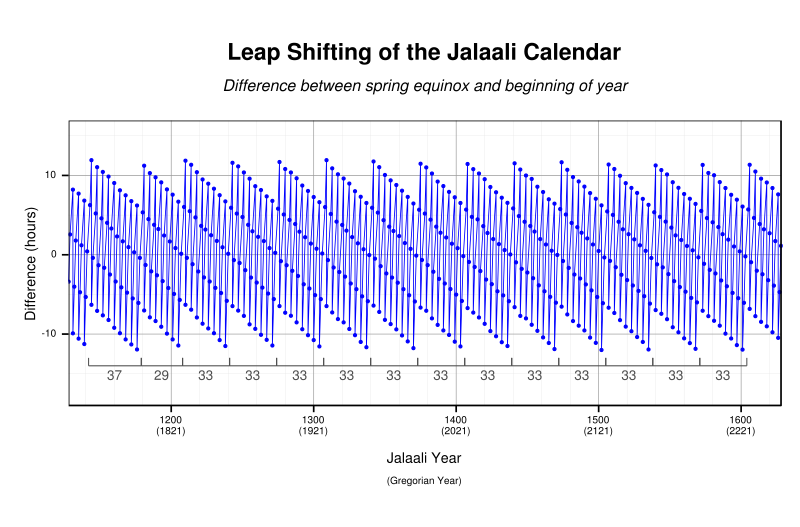 In a k'sidra ("in order") 354-day year, months have alternating 30 and 29 day lengths. In a chaser ("lacking") year, the month of Kislev is reduced to 29 days. In a malei ("filled") year, the month of Marcheshvan is increased to 30 days. 13-month years follow the same pattern, with the addition of the 30-day Adar Alef, giving them between 383 and 385 days. The observed and calculated versions of the Islamic calendar do not have regular leap days, even though both have lunar months containing 29 or 30 days, generally in alternating order. However, the tabular Islamic calendar used by Islamic astronomers during the Middle Ages and still used by some Muslims does have a regular leap day added to the last month of the lunar year in 11 years of a 30-year cycle. This additional day is found at the end of the last month, Dhu 'l-Hijja, which is also the month of the Hajj. The Hijri-Shamsi calendar, also adopted by the Ahmadiyya Muslim Community, is based on solar calculations and is similar to the Gregorian calendar in its structure with the exception that the first year starts with Hijra. In the Hindu calendar, which is a lunisolar calendar, the embolismic month is called adhika maas (extra month). It is the month in which the sun is in the same sign of the stellar zodiac on two consecutive dark moons. Adhika maas occurs once every 33 to 34 months, compensating for the approximately eleven fewer days per year in twelve lunar months than the solar calendar. Thus, Hindu festivals tend to occur within a given span of the Gregorian calendar. For example: the No Moon during Diwali festival occurs between mid-October and mid-November. Buddhist calendars in several related forms (each a simplified version of the Hindu calendar) are used on mainland Southeast Asia in the countries of Cambodia, Laos, Thailand, Myanmar (formerly Burma) and Sri Lanka. The Hindu Calendar also known as Vikram Samvat is used in Nepal as the national calendar. All the official work is done based on this calendar. The calendar followed in some parts of South India (mainly in Tamil Nadu) is solar. It has a leap year every four years. The Bahá'í calendar is a solar calendar composed of 19 months of 19 days each (361 days). Years begin at Naw-Rúz, on the vernal equinox, on or about March 21. A period of "Intercalary Days", called Ayyam-i-Ha, are inserted before the 19th month. This period normally has 4 days, but an extra day is added when needed to ensure that the following year starts on the vernal equinox. This is calculated and known years in advance. 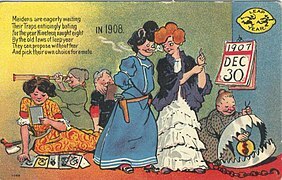 A spinster eagerly awaits the upcoming leap day, in this 1903 cartoon by Bob Satterfield. In Ireland and Britain, it is a tradition that women may propose marriage only in leap years. While it has been claimed that the tradition was initiated by Saint Patrick or Brigid of Kildare in 5th century Ireland, this is dubious, as the tradition has not been attested before the 19th century. Supposedly, a 1288 law by Queen Margaret of Scotland (then age five and living in Norway), required that fines be levied if a marriage proposal was refused by the man; compensation was deemed to be a pair of leather gloves, a single rose, £1 and a kiss. In some places the tradition was tightened to restricting female proposals to the modern leap day, February 29, or to the medieval (bissextile) leap day, February 24. According to Felten: "A play from the turn of the 17th century, 'The Maydes Metamorphosis,' has it that 'this is leape year/women wear breeches.' 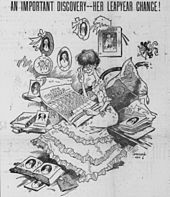 A few hundred years later, breeches wouldn't do at all: Women looking to take advantage of their opportunity to pitch woo were expected to wear a scarlet petticoat — fair warning, if you will." In Finland, the tradition is that if a man refuses a woman's proposal on leap day, he should buy her the fabrics for a skirt. In France, since 1980, a satirical newspaper entitled La Bougie du Sapeur is published only on leap year, on February 29. In Greece, marriage in a leap year is considered unlucky. One in five engaged couples in Greece will plan to avoid getting married in a leap year. In February 1988 the town of Anthony in Texas, declared itself "leap year capital of the world", and an international leapling birthday club was started. 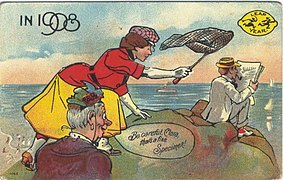 Woman capturing man with butterfly-net. A person born on February 29 may be called a "leapling" or a "leaper". In common years, they usually celebrate their birthdays on February 28. In some situations, March 1 is used as the birthday in a non-leap year, since it is the day following February 28. Technically, a leapling will have fewer birthday anniversaries than their age in years. 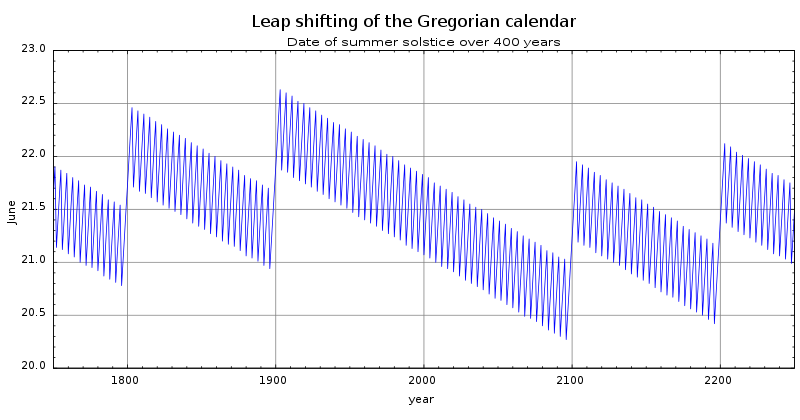 This phenomenon is exploited when a person claims to be only a quarter of their actual age, by counting their leap-year birthday anniversaries only: for example, in Gilbert and Sullivan's 1879 comic opera The Pirates of Penzance, Frederic the pirate apprentice discovers that he is bound to serve the pirates until his 21st birthday (that is, when he turns 88 years old, since 1900 was not a leap year) rather than until his 21st year. For legal purposes, legal birthdays depend on how local laws count time intervals. If a period fixed by weeks, months, and years does not commence from the beginning of a week, month, or year, it ends with the ending of the day which precedes the day of the last week, month, or year which corresponds to that on which it began to commence. But if there is no corresponding day in the last month, the period ends with the ending of the last day of the last month. The time at which a person attains a particular age expressed in years shall be the commencement of the anniversary corresponding to the date of [their] birth. Where a person has been born on February 29 in a leap year, the relevant anniversary in any year other than a leap year shall be taken to be March 1. This section shall apply only where the relevant anniversary falls on a date after the date of commencement of this Ordinance. Calendar reform includes proposals that have not (yet) been adopted. ^ "leap year – Definition of leap year in US English by Oxford Dictionaries". Oxford Dictionaries – English. Retrieved June 3, 2018. ^ Lerner, Ed. K. Lee; Lerner, Brenda W. (2004). "Calendar". The Gale Encyclopedia of Science. Detroit, MI: Gale. ^ Introduction to Calendars. (10 August 2017). United States Naval Observatory. ^ Lerner & Lerner 2004, p. 681. ^ Virtually no laws of Margaret survive. Indeed, none concerning her subjects are recorded in the twelve volume Acts of the Parliaments of Scotland (1814–75) covering the period 1124–1707 (two laws concerning young Margaret herself are recorded on pages 424 & 441–2 of volume I). ^ Age of Majority (Related Provisions) Ordinance (Ch. 410 Sec. 5), Hong Kong Department of Justice, June 30, 1997 (Enacted in 1990). Gray, Meghan. "29 Leap Year". Numberphile. Brady Haran.